Join us at 6:30 p.m. Thursday, Jan. 24 for the annual Phillies Winter Caravan at The Sands Event Center. You'll enjoy a full hour reception of Heavy Hors d'ouevres, a drink ticket followed by cash bar, our great silent auction, mystery ball drawing, baseball card photo booth and more! This year's VIP list includes Matt McBride, Nick Pivetta, Hector Neris, Dylan Cozens, Andrew Knapp, Phillies Manager Gabe Kapler and Assistant GM Bryan Minniti. Starting in 2019, the format no longer features a sit-down dinner. We will set up theatre-style seats so everyone gets closer to the team! After the reception, guests will have the opportunity to hear from the players, coaches and managers of our Phabulous Phillies about next year's season and have their questions answered. Of course the Philly Phanatic, FeRROUS and FeFe will be on hand to greet the fans! Sponsorships are available for additional tickets and at some levels, to attend the VIP reception at 5:30 p.m. -- one hour before the guest reception. The VIP Reception has an open bar and access to photo opportunities with some of the Phillies VIPs. 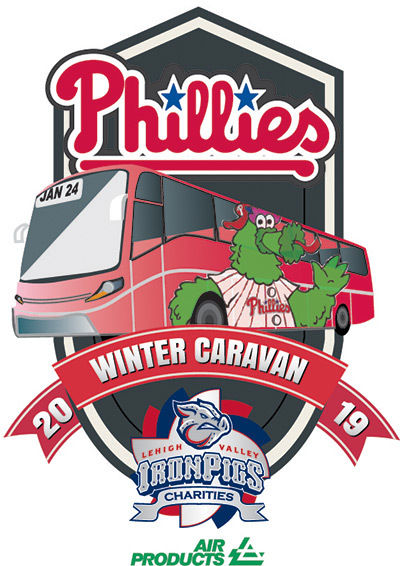 These tickets make great holiday gifts for your favorite Phillies and IronPigs fans, and for yourself, too!! Click on the buttons to the left to learn more and purchase tickets online. Check back to this site as we will announce the Phillies VIP's as we get closer to the event. Get your tickets today - we look forward to seeing you! Contact Diane Donaher (DDonaher@ironpigsbaseball.com) if you have any questions.